For all that it is well-known that Robert E. Howard was a native of Texas, whose wild imaginings of far off lands took place without his leaving the Lone Star State, it is too rare that the influence its landscape and people had on Howard's tales. It is an important question to ponder as most writers instill into their stories a sense of place. Sanford Allen, and his compadres (I was born in El Paso, so I'm allowed to use the word compadre) over at Mission Unknown, are writing a series of blog entries discussing San Antonio's place in the history of SF Universe. One may not necessarily think of San Antonio as particularly sfnal, so Mission Unknown is mapping out S.A.'s place on the SF map. The most recent entry is a discussion of San Antonio's influence on Robert E. Howard's writing. 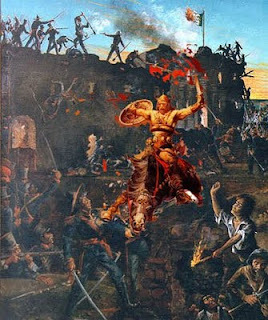 A nice companion to this line of thought is Monkeybrain Books' Blood and Thunder: the Life and Art of Robert E. Howard. Of particular interest in the Mission Unknown post is the influence that a valley an hour north of San Antonio -- a stone's throw in Texas -- had on Howard's poem Cimmeria.